Ben Pearson is excited to announce the new BP-08, combining Huth's and Ben Pearson's strengths, quality design and features in one package. 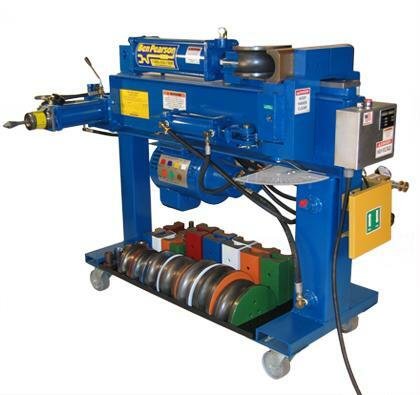 The BP-08 is a manually operated bender using a knee control for bending and the Huth I-beam construction with the maintenance-free guide plate. This bender is our new low-cost alternative for shops just starting up, adding a second bender or replacing an old bender. The sleek-designed main frame of the BP-08 provides maximum clearance for hard-to-bend pipes or when using bend data for a Ben Pearson bender. Designed to accommodate Ben Pearson bending dies and end-finishing tooling. Uses a double-ended cylinder for both solid and segmented end finishing. Features Ben Pearson quick-disconnect end-finishing tooling. The BP-08 is powered by a hefty 5 horsepower motor.